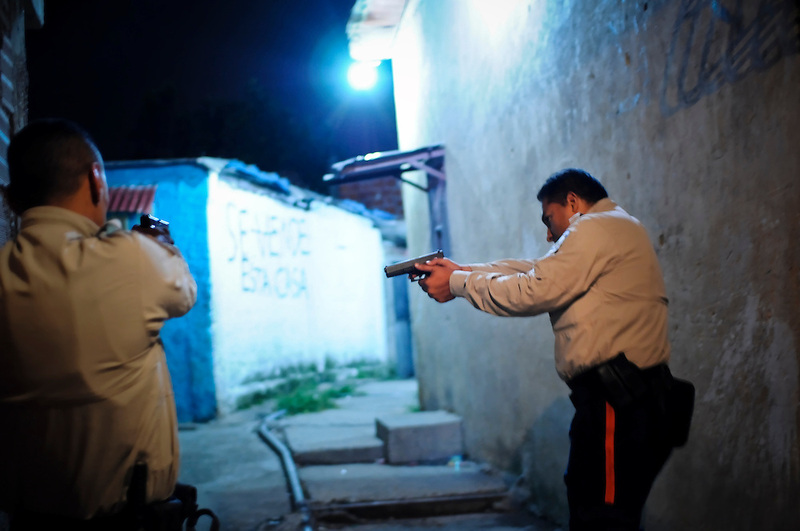 Members of a special tactical division of the Sucre police force conduct a late night foot patrol in Petare. The Petare slum is one of the most violent areas of Caracas, Venezuela, reporting over a dozen homicides every weekend. According to the ngo, the Venezuelan Observatory of Violence (OVV), Caracas has one of the highest violent crime rates in the world, with two people murdered every hour, a homicide rate that has quadrupled over the eleven year presidency of Hugo Chavez. Equally disturbing is the level of impunity, corruption and incompetency in the Venezuelan judicial system. OVV reports that 91% of crimes go unsolved in Venezuela.